The KitchenAid Gourmet Winged Corkscrew is perfect for celebrations or a quiet evening at home. The cast construction is strong and durable. The soft grip wings and knob provide added comfort. The special design allows removing of the cork from any wine bottle with minimal effort. The unique grip stabilizes the corkscrew when removing the cork. 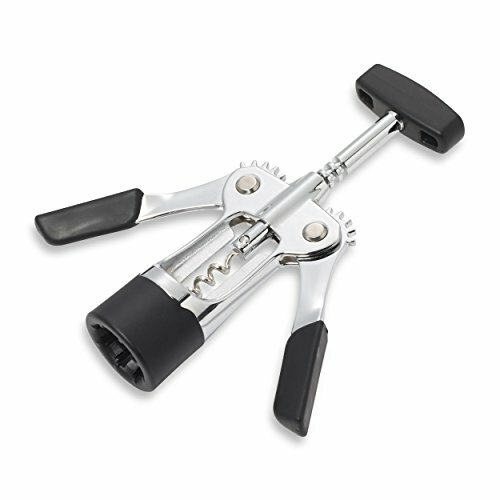 This corkscrew is dishwasher safe for fast and easy cleanup. One year hassle-free replacement and lifetime limited warranty. The cast construction is strong and durable. The soft grip wings and knob provide added comfort. The special design allows removing of the cork from any wine bottle with minimal effort. The unique grip stabilizes the corkscrew when removing the cork. This corkscrew is dishwasher safe.